During the Second World War Hungarian poet Miklós Radnóti was subject to forced labor because he was Jewish and was called up three times. The final time came on May 20, 1944, when he was sent to a German labor camp in Bor, Serbia, where he worked in the copper mines. I am sorry that I could not personally say goodbye. I wish to Mr Dr all the best, good strength and health to endure this terrible change, and I will also pray so I could see again in good strength and health Mr. Dr.
Radnóti never returned from this third forced conscription. With the advance of the Red Army, his group of forced laborers were force marched through Hungary and when he and 21 others were too weak to continue, they were shot and thrown in a mass grave. Eighteen months later, following the end of the war, the bodies were dug up and a notebook of his poems was discovered in his pocket. 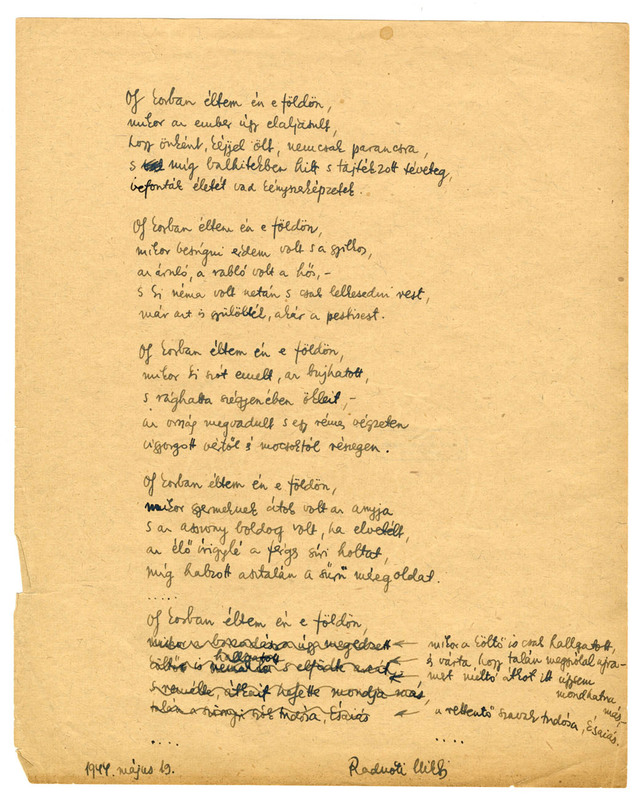 Much of the material on and from Radnóti was donated to the Library of the Hungarian Academy of Sciences by his widow Fanni Gyarmati in 2009. She is 101 years old now and still lives in the apartment she shared with the poet, which still has the nameplate on the door: Dr Miklós Radnóti. 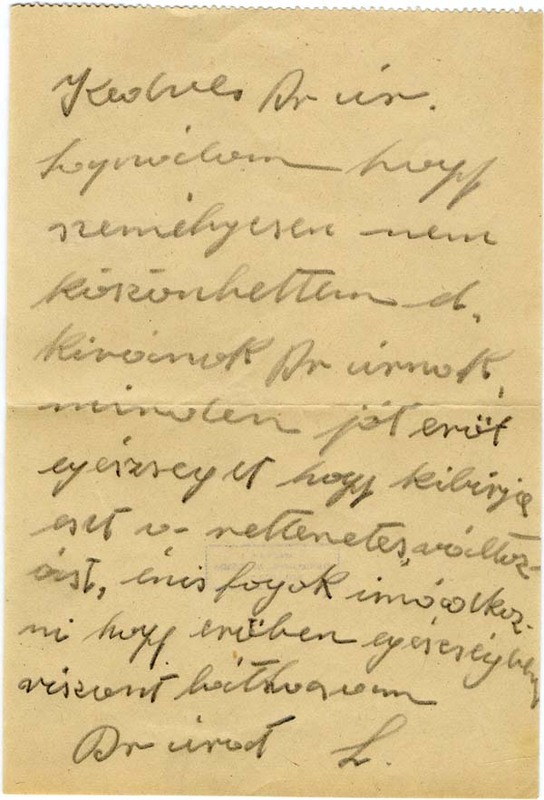 Read an article about her and her husband’s relationship on Hungarian Literature Online. 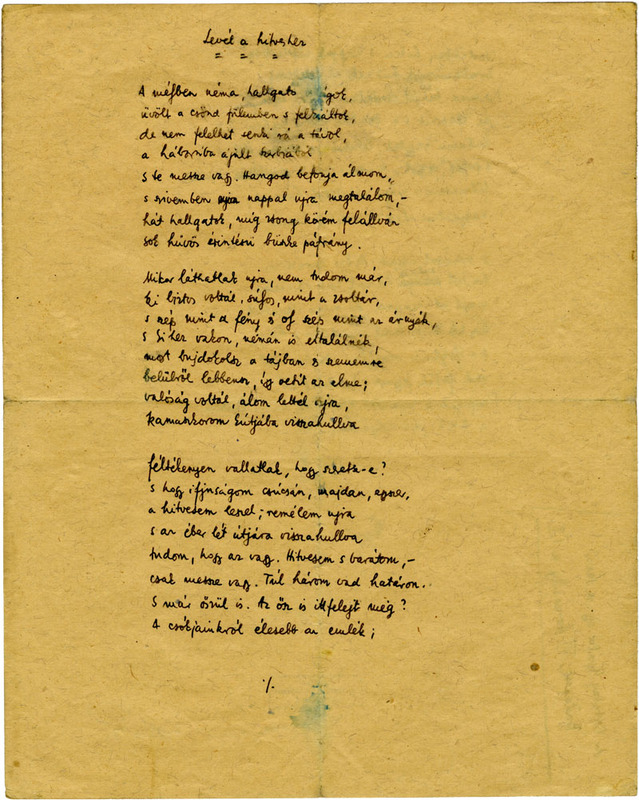 2009 marked the 100th centenary of Radnóti’s birth and a special exhibition was held, including quite a lot of material accessible online in both Hungarian and English, including poem manuscripts, letters, documents, photos and a good amount of information. The exhibition website is located here. Read the two poems published in B O D Y here. – Thanks to the Poemas del río Wang blog site for all the Radnóti information, especially the cleaning lady’s letter.